Acclaimed as “a world-class ensemble” (Russelsheimer Echo, Germany), Sinfonia Toronto is one of Canada’s finest chamber orchestras. The orchestra performs its Masterpiece Series in two of Toronto’s finest concert halls, CBC’s Glenn Gould Studio, where many of its concerts have been recorded for national broadcast, and the Toronto Centre for the Arts. 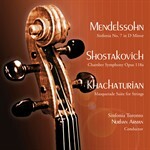 The orchestra has recorded on its own label and for Marquis Classics EMI, Cambria and Analekta. Sinfonia Toronto consists of virtuoso strings who perform standing, in the tradition of great European chamber orchestras, blending each musician’s soloistic energy and passion into a brilliant ensemble style under Nurhan Arman’s inspired direction. The orchestra’s repertoire includes all the major compositions for string orchestra from the Baroque through the Classical, Romantic and contemporary periods. Sinfonia Toronto has premiered many new works, and has been recognized by the Canada Council for the Arts for its commitment to performing music by Canadian composers. Sinfonia Toronto’s recordings are heard frequently on radio broadcasts. Their world premiere of the rediscovered Bach aria ‘Alles Mit Gott’ was recorded by Analekta and released on iTunes. The title work of the orchestra’s Marquis Classics CD of music by Canadian composer John Burge, Flanders Fields Reflections, won a national JUNO Award for Best Recording of a New Classical Work. The Hollywood Flute CD, with flutist Louise DiTullio and Premieres, featuring violinist Conrad Chow, were recorded by Cambria and are distributed by Naxos. The orchestra tours regularly throughout its home province of Ontario, playing on series in Brockville, Kingston, Lindsay, Midland, Port Hope, Sarnia, and annually in Barrie and Sault Ste-Marie. Sinfonia Toronto has enjoyed great success in international tours. Its 2008 tour in Germany drew headlines like ‘’Sinfonia Toronto Inspires,’’ and ‘’Sinfonia Toronto Thrilled the Audience.” Its 2010 tour of Spain was greeted with calls for encores at every concert, including a thrilling four encores demanded by the audience at the renowned hall l’Auditori in Barcelona. The orchestra performed in Florida in 2015, and in April 2018 for a two-week tour in Peru, Argentina and Uruguay. Every concert in South America received standing ovations, demands for multiple encores, superb reviews and requests to return. Sinfonia Toronto’s performances have been acclaimed by critics at home as well. The Toronto Star noted "a remarkable range of colour," "ample eloquence" and "gripping authority," and praised Grieg’s Holberg Suite and the Dvorak Serenade, "both of which Arman led in an affectionate, unhurried manner, with an appreciation of their singing qualities." The Barrie Advance headlined "A Treasured Experience" and described a performance with "tender longing" and "gusto." La Scena Musicale declared, "Nurhan Arman and his orchestra literally conquered us." Sinfonia Toronto has collaborated with outstanding soloists of national and international reputation. Among guest artists who have shared the stage with Maestro Arman and the orchestra are pianists Andre Laplante, Janina Fialkowska, Richard Raymond, Jane Coop, Robert Silverman and Alexander Ghindin; violinists Lara St. John, Dmitri Berlinsky, Corey Cerovsek, Jasper Wood, Judy Kang and Haik Kazazyan; cellists Shauna Rolston, Stéphane Tétreault and Narek Hakhnazaryan; clarinetist Julian Milkis; sopranos Nathalie Paulin and Aline Kutan. Born in Shenyang, China, Xiaohan Guo began her violin studies at the age of six, winning many awards in numerous youth competitions. Continuing her musical education, she enrolled at the Shenyang Conservatory at the age of 13. In 1998, she pursued her Bachelor’s Degree, majoring in violin, at the Shanghai Conservatory subsequently receiving first prize in the 2001 Mozart Violin Concerto Competition, whereby receiving an invitationto perform the Mozart’s Violin Concerto No. 4 with the Shanghai Youth Symphony Orchestra. Upon graduation she joined the Shanghai Broadcasting Symphony Orchestra, having the honor of performing with outstanding musicians such as Itzhak Perlman, Seiji Ozawa and Mstislav Rostropovich. She has been a student of Mrs. Eleonora Turovsky at University of Montreal since her arrival in Canada in 2004, completing her Master’s Degree and is now undertaking her Doctorate program. During her studies she was a winner of several bursaries. Xiaohan has given many solo and chamber music recitals at Chapel de Bon-Pasteur and University of Montreal, as well as being a guest soloist with I Musici de Montreal Chamber Orchestra with Waxman ’s Carmen Fantasy. Canadian violinist Marcus Willem Scholtes has a Doctor of Music degree in Violin Performance from Indiana University where he studied with renowned pedagogue Mimi Zweig. He holds a Master of Music degree from the University of Michigan, Ann Arbor, and an Honours Bachelor of Music degree from McGill University, Montreal. Dr. Scholtes currently teaches at the Wilfrid Laurier University String Academy and has also been professor of String Pedagogy. He has performed internationally at music festivals in Canada, the USA, and Europe and has attended the Britten-Pears Young Artist Programme in Suffolk, England. He has toured with the Aldeburgh World Orchestra in 2012, in Germany and Holland before playing at the BBC Proms as part of the 2012 London Olympiad. He has participated in the Aldeburgh String Residency Programme in 2010 and 2012, and was again invited to join the Residency as part of the Britten Centenary concerts in 2013. A vibrant young violinist, Emily Hau is currently Principal Second of Sinfonia Toronto. Her active freelancing schedule has recently included travels throughout Canada, the United States, Japan, Italy, Jamaica, England and Germany. Emily has been the recipient ofnumerous awards and scholarships from the University of Houston, the University of Toronto, the Starling Endowment, and the Canadian Aldeburgh Foundation. She is a graduate of University of Houston’s Moores School of Music, where she received both her Bachelor and Master of Music degrees, following studies with the distinguished artist Fredell Lack, and Emanuel Borok, concertmaster of Dallas Symphony. While still a student, Emily performed in selective master classes with artists such as Ruggiero Ricci, James Buswell, Kyung Sun Lee, Charles Castleman and Rachel Podger. Emily’s musical experiences over the years have allowed her to develop a unique and varied musical profile. In demand as a studio recording artist, she also contributes improvisatory stylings to several contemporary Christian worship bands. Her love for diverse collaborative projects, range from her work with the deVah quartet, to performances with Diana Krall and Kanye West. As an avid orchestral and chamber musician, Emily has spent several summers abroad at Banff, Britten-Pears, Schlern and Pacific Music Festivals, enabling her to study and perform with some of the most renowned teachers and conductors of our time. She has worked with conductors Riccardo Muti, Andrey Boeyko and Robin Ticciati, and previously studied with Zhang Yun Zhang, Lorand Fenyves and Paul Kantor. Sarah Boyer was born in Toronto and began her musical studies at the Royal Conservatory and summer schools such as Domain Forget, Quebec; Courntney B.C. ; Interlochen, Michigan; and the Quartet Program, Pennsylvania via numerous scholarships. Her teachers included Jacques Israelievitch, Camilla Wicks, Charles Castleman and Oleg Krysa. She graduated from the Eastman School of Music in Rochester N.Y., attended the fall and winter residency program at the Banff Centre for the Arts, and the European Mozart Academy in Krakow, Poland. Her solo and chamber music career has included performances in Europe under Luciano Beriot, concerts at the Incontri di Canna music festival in Italy where she was featured in a documentary which is being shown all over North America on the Bravo Channel. As a freelance musician she has worked in most of the cities in upstate New York, Pennsylvania and Toronto. Sarah Boyer also has been very active as a teacher where she taught at Mercyhurst College in Erie PA, and was the director of the String program at the Conservatory Young Artist Program in the D'Angelo School of Music. Canadian violinist Tanya Charles studied at the University of Toronto and the Glenn Gould School. She has been concertmaster of the Royal Conservatory Orchestra and the National Youth Orchestra. She is a member of the Gould String Quartet, and regularly performs with many orchestras in Ontario. Violinist Adam Diderrich will join the orchestra for 2016-17 season as a one-year leave replacement. He is a native of Milwaukee, Wisconsin. He began playing violin at age five. His advanced studies brought him to the University of Toronto and later to Lynn University in Boca Raton, Florida for studies with Elmar Oliveira and Stephen Majeske. Most recently, he pursued a D.M.A. at the University of Miami with Glenn Basham and Felicia Moye. He has played with orchestras such as the New World Symphony, the Naples Philharmonic, Florida Grand Opera, Palm Beach Opera, the Palm Beach Symphony and many others. Violinist Alex Toskov has performed as soloist with the Serbian Radio Symphony, served as concertmaster of the Bayreuth Festival Orchestra in 2006 and of the Deutsch-Skandinavische Jugend Philharmonie in 2009. Originally from Serbia, in Canada Mr. Toskov won the Glenn Gould School's 2011 Chamber Music Competition. A recipient of numerous awards and scholarships, violinist Praise Lam is emerging as a highly active soloist, chamber musician and orchestral musician both in Canada and abroad. In 2002, Praise was invited to play for the Canadian Ambassador to China and the Director of the Canada Arts Council in Beijing. Since capturing the 2003 EmergingPerforming Arts Award at the Mississauga Arts Awards, Praise’s solo performances has taken her from her hometown orchestral stage with the Mississauga Philharmonic Orchestra to television appearances with Rogers Cable & CBC to Hollywood’s 20th Century Fox Newman Scoring Stage in Los Angeles, California. Praise holds an ARCT Diploma from the Royal Conservatory of Music, a Bachelor of Music Performance degree and a Bachelor of Education degree from the University of Toronto and has also spent two years of applied violin studies with Professor Lin Yaoji at the Beijing Central Conservatory of Music. Praise also had the opportunity to play for such esteemed musicians as Jose Luis Garcia, Mauricio Fuks, and members of the St. Lawrence String Quartet, the Orford String Quartet, and the Prazak String Quaret. Praise held the position as conductor of the Mississauga Youth Orchestra’s Junior Concert Strings in 2000-2001 and continues to maintain an active role in music education. In her early years, Praise had been active as an accomplished pianist as well as a composer. A consistent award winner in both fields, Praise began her piano studies at age 4 and composition at age 9. A student of Canadian composer Larysa Kuzmenko at the Royal Conservatory, Praise Lam won the Ettore Mazzoleni Memorial Composition Scholarship and the Dr. Igor Kuchivnsky Memorial Composition Scholarship for three years. She was 15 when she first held the position of student composer-in-residence and 16 when her Shadows of a Journey was premiered by the Royal Conservatory Chamber Orchestra under the baton of Simon Streatfield. Her commission at age 18 by the Mississauga Symphony to compose an orchestral work was her last official work before she decided to pursue a full-time career as a violinist. Anthony Rapoport is principal violist of Sinfonia Toronto and a founding member of the Windermere String Quartet and the Aradia Ensemble, with whom he has recorded over a dozen internationally released CDs. On tour as soloist with Aradia, he was acclaimed as “a splendid violist” by the New Zealand Herald. Anthony received the Doctor of Musical Arts degree from the Juilliard School in New York. Caitlin Boyle is originally from Dundas, Ontario. She completed her Bachelor of Music at the Glenn Gould School, studying with Steven Dann; an Artist Diploma at the Hochschule fur Musik Muenchen; a Masters of Music at San Diego State University; and a Graduate Diploma at McGill University. Her passion for chamber music was fostered at the Southern Ontario Chamber Music Institute and Domaine Forget Chamber Music Sessions, and continued to grow through the support of such artists as Richard Lester, Terence Helmer and the St. Lawrence String Quartet. She has been a member of the Cecilia String Quartet since spring 2006. She plays on a viola made in 2002 by Joseph Curtin. In her spare time she enjoys biking, reading and theatre. András Weber received his musical training in Budapest, Hungary. His mentor, Janos Starker, has been a major influence in his work. He has been principal cellist withorchestras in Hungary, Mexico City and Canada, and has given concerts in North America, Europe and Korea. He was the winner of DEBUT in Montreal where The Gazette called him a "generously gifted" musician who plays with a "nicely coloured and singing tone." Mr. Weber has recorded in Hungary and Canada and plans to release three CD's: solo cello pieces, music for cello and organ with his wife Ran Kim and works for harp and cello with the acclaimed Mexican harpist Mercedes Gómez. Mr. Weber is the founding director of the Toronto series 'Music Alive!' and teaches at the Royal Conservatory of Music. He is the founding member of Toronto Piano Trio and was member of the famed Arthur LeBlanc quartet. He has played concertos with many orchestras around the world. Sarah Steeves is a graduate of McGill University with a Master of Music in Performance where she studied with Brian Manker. She previously completed her Bachelor of Music with Honours in Performance at the University of Toronto. As a soloist, chamber musician and orchestral player, Sarah has performed at the Aldeburgh, Banff, Domaine Forget, Orford, Toronto Bach, Toronto Summer Music, and Windy Mountain Music Festivals. She has performed with the Disney’s Young Musicians Symphony Orchestra, Mississauga Symphony,National Youth Orchestra of Canada, Orchestra London, Sudbury Symphony, and the Youth Orchestra of the Americas. Keenly interested in contemporary music, Sarah has performed at McGill University’s MusiMars and the University of Toronto’s New Music Festivals. She has premiered new works by many young Canadian composers, including a commission of Kevin Lau’s Starsail in March 2008. Since beginning cello lessons with Tom Mirhady of Calgary Philharmonic at the age of three, Sarah has worked with many great musicians including Rivka Golani, Lawrence Lesser, Edgar Meyer, Aldo Parisot, and Janos Starker as well as the Leipzig and St. Lawrence String Quartets. As a registered Suzuki teacher, Sarah has maintained studios at the Wychwood Music School and the McGill Conservatory. She currently teaches privately at the Classical Music Conservatory and is a doctoral student at the University of Toronto studying with Shauna Rolston. Sarah’s 2009-2010 season will include a recital at the Arts & Letters Club of Toronto with Angela Park and touring China as a member of The World Orchestra of Jeunesses Musicales. Calum MacLeod was born, raised and educated in Toronto and started freelancing as adouble bass player in the jazz and classical styles as soon as he could improvise a bass line and read a part. He began studying bass in public school strings programs. His first teacher on bass and his only instructor in playing jazz bass was Richard Felix (Toronto freelancer). During his formative years his principal teacher and mentor in classical bass playing was Paul Rogers of the Toronto Symphony Orchestra. Calum has performed with such orchestras as the Oshawa/Durham Symphony Orchestra, Peterborough Symphony, Symphony Niagara, Esprit Orchestra, Talisker Players, and the Toronto Symphony. Calum wishes to express his enthusiasm for being a part of Sinfonia Toronto and hopes to see you all at the next show!